Let’s be honest, fly fishing vests are quite a lot less popular than 20 years ago. It’s because people assume that their design hasn’t changed, expecting them to look like something that our your grandpa wore back in the days. The best fly fishing vests you can get today, look like something Tom Cruise wore in Mission Impossible. It might just seem like minor accessories, but a decent storage system is a crucial part of equipment, as many anglers who are new to this type of fishing find out. 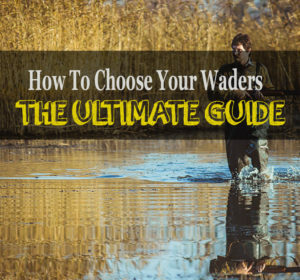 Beginners give everything else so much thought; the rod, the lures, polarized sunglasses. 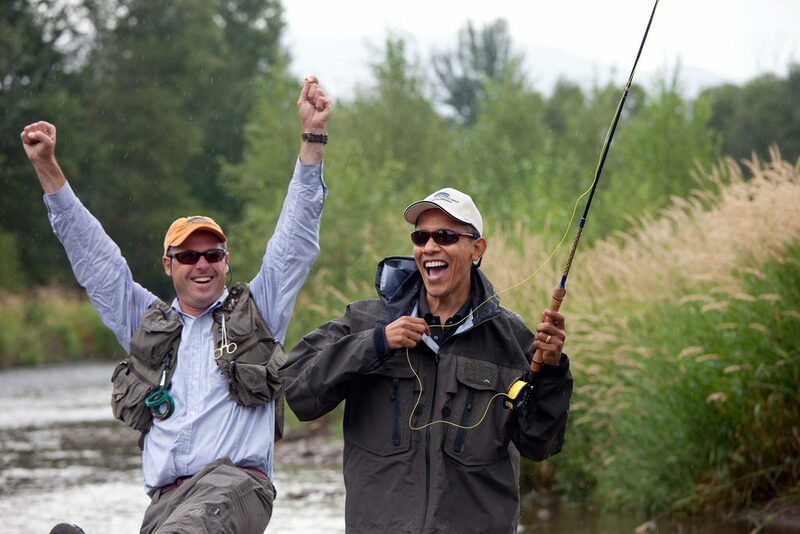 Then they get to the vest and grab the first thing they see made by a manufacturer in China, who might very well not even know what fly fishing is. I know it’s more fun buying flies and rods, but once out on the river a good fly fishing vest will make the day far more enjoyable. Why? Because you can keep most, if not all of your tackle right on your body. No wading back out of the river to get a different tippet, leader, flies, you name it. Do yourself a solid, and take the time to pick out something that is functional. Hopefully the guide I outline below gives you a good vantage point, and you don’t end up in the river wondering how the other guys have such a smooth rhythm while you are flipping and flopping in your vest made in Pakistan(no offense to Pakistani’s intended). If you have few key aspects in mind when buying a fly fishing vest, it’s really not such a complex piece of equipment. Since it is clothing, durability should be up there in the importance factors. Another thing is to have plenty of storage spaces, namely pockets. You will need them to have your gear close at hand. Your vest is your tackle box when it comes to fly fishing. Finally, comfort is always good to keep in mind if you are like me and spend hours fishing at a time. A vest that is heavy, or too tight will end your day early, and you do not want that. I will show you how to find all three without sacrificing anything. Choosing a fly fishing vest might seem like an in and out kind of deal, but really it takes a bit of time. Take the time to try it on, or measure yourself if ordering online. Check hems and stitch areas to ensure quality work. Having a pocket rip makes it pretty much worthless. Material is important too. Mesh vests are intended for warmer fishing, and are the most flexible as far as movement goes. They can be durable, but without a whole lot of fabric, they are easy to wear out. Next are vests made of a light fabric like polyester but with a mesh lining. These can be used in a variety of places. Then for cooler climates I would pick a full polyester or cotton vest. What you need here is dependent upon your fishing habitat. Make sure when you have your vest on, and it is full of gear that the weight is evenly distributed. This is a sign of a good vest. Too many pockets in one area will wear out that area quicker, and also make for a sore back at the end of the day. Pockets are very important for this particular piece of equipment. I mean that is what it is used for. Having too many can be just as big a problem as not having enough. Things get unorganized very quickly, and soon you are not fishing, but trying to find this or that. Something with ten-to-twenty pockets is a good parameter. Size of pockets matter also. Having some small, and some larger helps to keep things where they should be. It is also a good idea to have a few zippered pockets to keep things like cell phones or matches in because they won’t do you much good after falling in the river. Take a mental inventory of what you use the most often. This is how many pockets you should strive for plus one or two for other things. I notice that the more pockets anglers have, the more stuff they don’t really need comes with. Keep it simple. This is an important factor, more so than many newcomers realize. Look for a vest that reduces, or aims to minimize the weight put on the back and shoulders. Many have specialized systems for this, so look for it. Standing waist deep in a river for eight hours with bricks pulling on your shoulders is not a fun day at all. Material is more a personal decision. The vest usually sits over your clothing, so as long as it does not overheat you, or freeze you up it should be good. Lighter material equals more mobility is an easy way to remember. Heavy material equals more warmth. Look at where pockets are positioned on the vest. Many companies have them distributed to keep stress points from developing over long periods of time. Make sure it fits over whatever you plan to wear, not too loose and not too tight. After laying out what my main focus points are when it comes to fly fishing vests I will now give you 4 quick reviews of the products I have chosen accordingly. 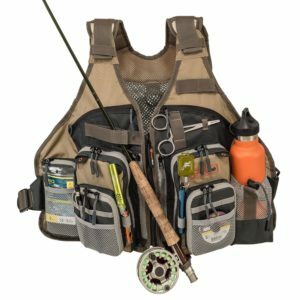 All of them shine in most of the stuff listed above and are -what I would consider- the best fly fishing vests for the money. This vest is simply a work of fishing art in my mind. 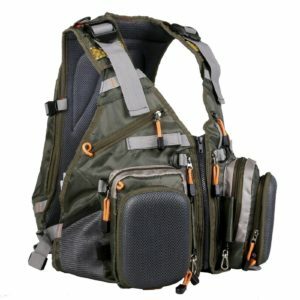 Maxcatch combined the comfort of a fly fishing vest with a hiking backpack. There are two models, and I really like the “plus” version because it comes with two hard cases to store your flies, which is an important piece of equipment when fly fishing. Although it looks bulky it is surprisingly lightweight and the mesh lining keeps you cool. There are plenty of pockets, but they are so well designed in the vest that keeping things organized is a cinch. This beauty also comes with a rod holder, and a water bladder hook. They pretty much thought of everything with this vest. The weight distribution is fantastic. It has adjustable shoulder and waist straps that are padded to keep you comfortable, and a zipper in front to help keep the weight evenly distributed. This pack is sure to please with all the amenities it offers and definitely deserves a place on the list of the best fly fishing vests. This versatile fly fishing/outdoor vest is ready for just about anything. Made from lightweight mesh fabric with padded straps for shoulders, it is lightweight and ready for gear. It has six zippered front pockets, two chest pouch pockets, two inside pockets with zip down fly bench. The back of this vest has a large pouch for rain gear, blankets, or anything else you may need where you are headed. I have been hunting and fishing in some pretty remote places. If you have been there, then you know how fast mother nature can change without warning. 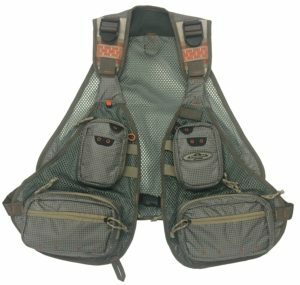 This vest not only provides enough pockets for usual fly fishing gear, but also has room for emergency supplies. This extra space could have come in handy for me on a couple of occasions. It is very adjustable to nearly any size. The amount of storage really has to be seen to be believed. This vest is waterproof to keep those cell phones dry. It also has gear attachment cords, D-ring net lash, webbing, and chest rod holder to round out this beauty. This vest is a unique design made for warmer conditions. 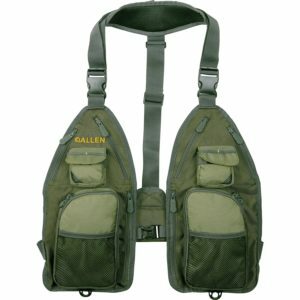 Less a vest, and more a set of pockets that you can wear, Allen Gallatin breaks this vest down to the bare minimum without sacrificing the needs of fly fishing. It has ten pockets in the front, two of them perfect for fly fishing boxes. It also has an interior mesh pocket on right and left side for extra storage. Padded neck strap eases the weight load and helps keep you comfortable when carrying your load. The neck strap also has a D-ring for holding your net or other gear. Adjustable straps make it versatile, and able to fit nearly any size. Excellent pocket placement combined with the minimalist design ensure you will be doing what you set out to do instead of digging through pocket after pocket. It is a vest meant for multiple settings, not just fly fishing. If you are into multi-use equipment, this is about as good as it gets. This vest carries the load of even the most geared up fly fisherman. With thirteen+ pockets designed for their own purpose, it will keep you organized and ready to fish. Two pockets are waterproof for cell phones etc. The back is made of mesh to let air circulate and keep you cool. The zippers have cord-pulls attached making it easy to open and close those pockets on the “fly.” This is one of the most lightweight vests out there. Adjustable straps at the shoulders and waist make it a good fit for most anyone, man or woman. They also put a water bottle pocket on this one to make it easier than ever to stay hydrated on those long days. It evenly distributes weight across your chest and shoulders ensuring you do not end up with stress points after a long day. So Which Fly Fishing Vest Is The “Flyest”? These are all great vests for fly fishing, or any kind of fishing for that matter. In the end it came down to two, that really made a run for my vote. After much consideration, I chose the Maxcatch. This vest really has everything in mind for the fly fisherman. Even though it has more pockets than I usually find useful, they took time to place them and design them for specific gear. This idea that everything has its own spot really works for me. Also, the built in hard cases for flies, rod holder, and water bottle holder are all found on the other vests, but not all on one except this one. Another dilemma solved in the outdoor world. Remember that the gear you need may not be the same that I need. Think about your uses for your gear, and the environment it will be used in. These are much more important than looks, or price. Time to go get that overlooked vest and start flicking that wrist.